"I believe that Judge Brett Kavanaugh will soon be Justice Brett Kavanaugh." Despite the political theater surrounding Judge Brett Kavanaugh's confirmation process, Vice President Mike Pence’s support for President Donald Trump’s Supreme Court pick has not wavered. "I believe that Judge Brett Kavanaugh will soon be Justice Brett Kavanaugh and take his seat on the Supreme Court of the United States of America," he said to the crowd at the Values Voter Summit Saturday. Invoking a similar declaration that Senate Majority Leader Mitch McConnell made from the same stage Friday — in which he said, "In the very near future, Judge Kavanaugh will be on the United States Supreme Court" — Pence electrified the crowd to their feet. (Susan Walsh/AP) Vice President Mike Pence speaks at the 2018 Values Voter Summit in Washington, Sept. 22, 2018. The Senate Judiciary Committee was set to vote on Kavanaugh's nomination last Thursday and send it for a full vote before the Senate floor, but word of a letter from California professor Christine Blasey Ford detailing allegations that he drunkenly assaulted her when they were in high school brought the entire process into turmoil. Kavanaugh has emphatically denied the allegation, and agreed to publicly testify under oath about the incident, while Republican committee members and Ford continue to engage in negotiations about the possibility of her testifying publicly or privately as early as this week. Both Republicans and Democrats say she should be heard. Without mentioning Ford or the allegations against the embattled nominee, Pence instead underscored Kavanaugh's qualifications in his long career as a circuit court judge on the D.C. Circuit Court to serve on the nation's highest court. "Judge Brett Kavanuagh is a man of integrity with impeccable credentials," Pence continued. "His record and career deserves the respect of every member of the United States Senate." From the onset, Kavanaugh's confirmation has been political brinkmanship between Democrats and Republicans, and showed visible signs of hostility during the Senate Judiciary Committee's hearings. Many Democrats, criticized for turning the public process into a show, were also criticized by attendees at the annual political conference for "grandstanding" during interviews with ABC News. Pence panned the Democrats on the committee for their behavior throughout the process, and drew boos from the crowd everytime he said the word "Democrats." 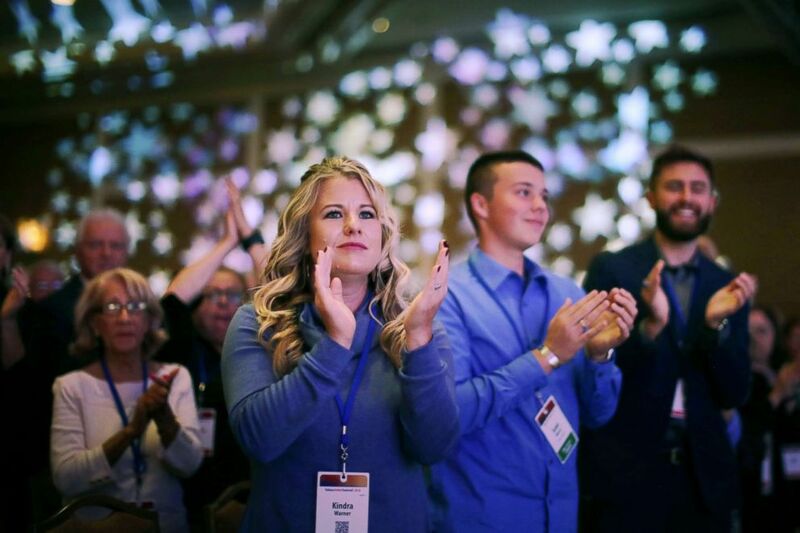 (Chip Somodevilla/Getty Images, FILE) Attendees applaud for Senate Majority Leader Mitch McConnell during the Family Research Council's Value Voters Summit at the Omni Shoreham Hotel, Sept. 21, 2018, in Washington, DC. "The way some Democrats have conducted themselves during this process is a disgrace and a disservice to the Senate and the American people," the vice president said. "The president and I are confident that Senate Republicans will manage this confirmation properly and with the utmost respect for all concerned," he added. 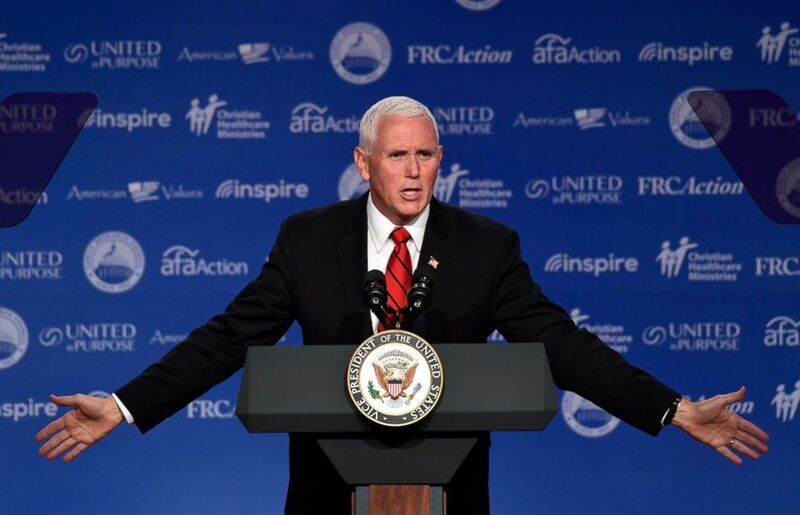 Pence issued a call to action for the Evangelical crowd at the summit, hoping to galvanize conservative voters to head to the polls in November. "Complacency is the greatest threat to our majority on Capitol Hill," he said. "We must surpass the energy of the American left. We will win if we get out the vote." He even imitated Trump’s mannerisms, throwing his arms into the air as he said, "As the president said two nights ago in Las Vegas … You gotta get out for the midterms!" "We made history in 2016, we’re going to make history again in 2018 when we re-elect Republican majorities in the House and Senate on Capitol Hill," he said.